I have diligently researched my symptoms/possible causes but cannot find much info on my specific symptoms. So here goes.. Diet] Microwavable meals and cold food recently due to working out of town, staying in hotels. Carpenter - About 3 Years - I'm part of a 4 man crew that builds houses, I spend most of my time rough framing and sheeting. This requires wearing a heavy tool belt w/ shoulder straps and a lot of ladder use, power tool use, hammering, heavy lifting, and stretching. It's not uncommon to do many of these tasks simultaneously and for long periods of time. My average schedule has been 10-16hr days, 6 days a week. When we're behind due to delays we often skip our day off; since May 1st I've had only 2 days off and a handful of days under 14hrs, 18 days of work in a row being the longest streak. Note] I can't be sure if I have some of the common CTS related symptoms. I wasn't sleeping well before so waking up multiple times a night is a normal inconvenience. Work keeps me sore 24/7 making it hard to distinguish possible symptoms from the usual aches. And I've always had anxiety and a slight depression issue. Because of these things I am only including symptoms that are new or worse. Intensity] Left Hand 3/5, Right Hand 4/5. Worst pain coming from overly sensitive fingertips. Relief] None. Nothing helps. Not ibuprofen or a certain position. Not when using a brace or doing stretches. Not 1 moment has it stopped. The only peace I get from it are the few choppy hours of bad sleep that I can manage. Other Possibly Related Info] I worked an extra long day on Saturday, May 6th. In the middle of the day I crouched to take a measurement. As I stood up my back audibly cracked, I'd describe it as top half-zipper (? ), but it didn't hurt at all. It actually felt very good as I'm often stiff and never intentionally crack my back or neck. As we were cleaning up at the end of the day I hit my right elbow, at the funny bone area, really hard on an aluminum extension ladder. Hard enough to leave an inch long cut and swell/bruise within the hour. I cleaned up the cut when I got to the hotel and iced it periodically during the 3 hour drive home (I live with a co-worker so he drove). After getting home I stayed up long enough to unpack, do a load of laundry and start a 2nd. My hands and fingers felt 100% normal when I went to sleep. When I woke up the next morning my hands were like this. I have tried nsaids, ice, sleeping with wrist braces, hot shower, and had a friend give me a back massage (handheld vibrating thingy with 3 rounded legs). Nothing has helped in the slightest and it's taking a toll on my quality of life. So here I am, having read that chiropractic problems could be to blame. Any recommendation or direction would be greatly appreciated. Thank you for bearing with me through the long read. Love the site. Obviously you smoke, and drink too much, which is not to be recommended and they will get you in time, but you know that, and they are probably unrelated. 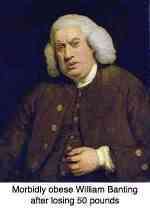 Perhaps even worse, James, is you just work too hard; whew, it's no wonder you body is complaining. All work and no play, makes Tom a dull boy; James too! 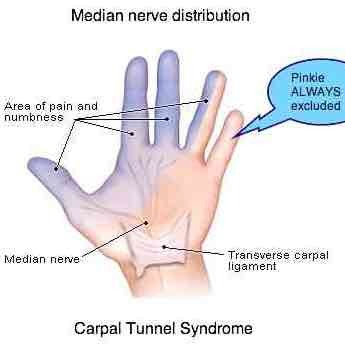 That bang on the funnybone, painful though it must have been, is probably unrelated too; it would affect the ulnar nerve that goes to the pinkie, whereas carpal tunnel syndrome, if that's what it is, affects the median nerve, and never goes to the little finger. Does the pattern of tingling and pain fit with that above? There are a lot of areas where the median nerve could be affected, especially for someone like you who does hard physical work; under the pec minor tendon in the chest, under the first rib, in the elbow are all potential sites. And of course in your neck; ever fall off the scaffolding? Car accidents? Do movements of your neck affect your arms? Here's an important one; when your arms are tingling, does raising your hands above your head increase or decrease the tingling? Then, because of your smoking, we need to consider conditions of the blood vessels too. In short, a thorough examination is called for. And a holiday!